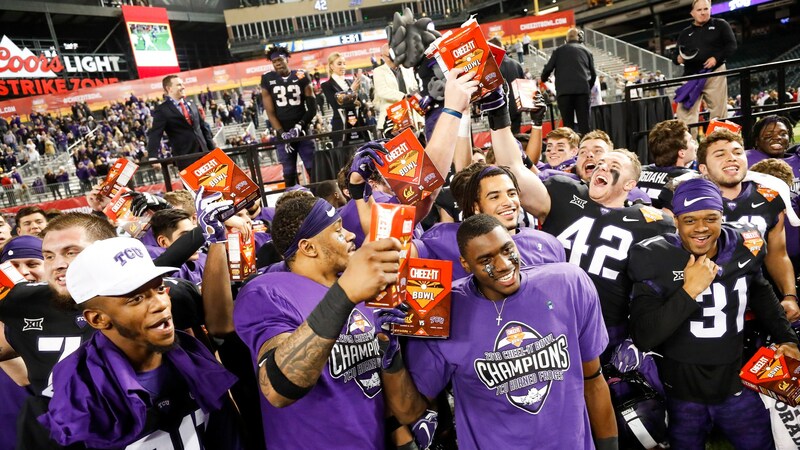 After a season where it seemed like everything that could go wrong for TCU football did, the Horned Frogs overcame four interceptions to win the Cheez-It Bowl 10-7 over California in overtime. “This game defined our whole season,” head coach Gary Patterson said of what has been the craziest bowl game of the year to date. Four different quarterbacks saw action for the two teams, combining for nine interceptions in the game. The ball was punted 15 times between the two squads. TCU quarterback Grayson Muehlstein threw four of those interceptions, while finishing just 7-for-20 for 28 passing yards. To make up for the Horned Frogs’ lack of a passing attack, running back Sewo Olonilua used 32 carries to gain a career-high 194 yards. The junior scored TCU’s lone touchdown on a one-yard run to end the third quarter. “If he’ll [Olonilua] keep running like that, someday, he’ll make a lot of money,” Patterson said. Chase Garbers started the game at quarterback for Cal, but he was replaced midway through the game by fifth-year senior Chase Forrest. Garbers ran in the first touchdown of the game early in the first quarter but threw three interceptions in a span of five drives and was benched. Forrest finished with two interceptions, the second of which was picked off in overtime by TCU linebacker Jawuan Johnson. Johnson came just five yards short of ending the game on his return, as he was tripped up after an 84-yard return. The five interceptions by the TCU defense tied the single-game high in the Gary Patterson era. The Horned Frogs capitalized on their next possession, marching to the Golden Bears’ 10-yard line before Jonathon Song’s 27-yard field goal won the game for TCU. The Horned Frogs had missed a chance to win the game at the end of regulation when Cole Bunce’s 44-yard field goal attempt sailed wide left, sending the game into overtime. After averaging just under 90 receiving yards per game this season, second team All-Big 12 wide receiver Jalen Reagor finished without a catch in the contest. One of the most dynamic players in the country, Reagor made his presence known on special teams, totaling 98 return yards, including a 58-yard punt return in the third quarter that set up the Olonilua touchdown. The win gives TCU its 15th winning season and 11th bowl win in Patterson’s 18 years as head coach.